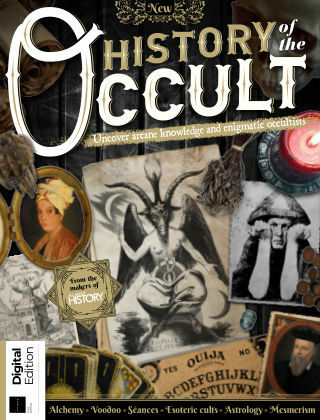 With Readly you can read All About History - History of the Occult and thousands of other magazines on your tablet and smartphone. Get access to all with just one subscription. New releases and back issues – all included. "Knowledge of the occult is knowledge of the unmeasurable; the paranormal, the spiritual, and the arcane. Its origins are shrouded in mystery. History of the Occult delves deep into the past to investigate the hidden history of all things cryptic, mystic and other-worldly. Read about the lives of famous and controversial occultists, from Elizabeth I's court magician and astrologer John Dee, to possible prophet Nostradamus, and Aleister Crowley, denounced in the popular press as ""the wickedest man in the world"". Uncover spellbinding secrets about how astrology was used to find the best date for a coronation, how alchemists believed they could turn lead into gold, why seances became so popular, or how tarot cards could divine a person's future. Explore the mythic origins of the occult's most influential practitioner, Hermes Trismegistus, and how his spells and teachings have spread worldwide. Discover the runes, rituals and star signs behind the rise and fall of Hitler's Third Reich and how the ""Mad Monk"" Rasputin's dark powers influenced Russian royalty. Packed with incredible illustrations and insights, this is the perfect guide for believers and sceptics alike. Also inside: -The Knights Templar -Renaissance Magic -Kabbalah -Paracelsus -Origins of Voodoo -Marie Laveau, the Voodoo Queen -The Occult Revival -Eliphas Levi -Gerald Gardener & Wicca And much more!"